Please note: following this mod as described below will simultaneously perform the full time 12v power mod giving you constant power to both the front and rear 12v auxiliary power points as well. Beginning in 2003 the Toyota 4Runner could be optioned to include a 115-Volt AC power outlet. The option code is "NA". The invoice price for this option on my vehicle was $80. 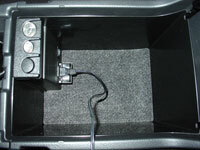 The 115v power outlet is located inside the center console. 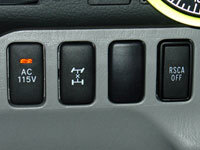 100 watts of power are available at this outlet via a power inverter which converts 12v DC power to 115v AC power when the AC 115V switch, located on the dash, is depressed and the ignition key is in the on position (does not work in the accessory position). For various reasons one may want to have power available at this outlet when the vehicle is off. This modification accomplishes that. 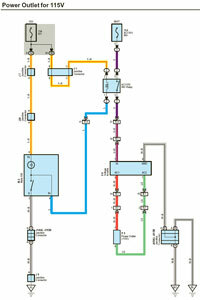 First, open the engine room relay/junction box and pull out the ACC 115V INV Relay. 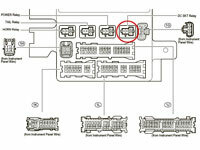 Pins #1 & #2 are the coil side of the relay. 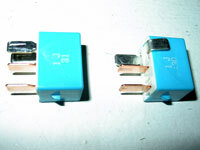 Pins #3 & #5 are the switch side of the relay. The upper left pin is #2. 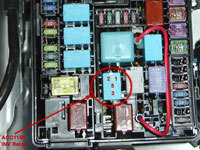 That is where 12v positive is needed to activate the coil if the dash switch is depressed. Pressing the dash switch provides ground to pin #1. 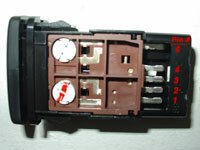 Currently pin #2 is provided 12v positive from the IG1 fuse which is not active until the ignition switch is in the on position. We need to change that so that 12v positive can be sent to pin #2 anytime (with the vehicle off). Bend pin #2 so that it no longer inserts into its usual location. 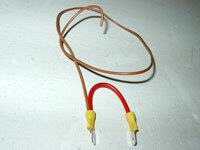 Take a short piece (approx 7") of 14 gague wire and crimp on a fully insulated female quick disconnecting terminal with a 0.187" tab. Do not use a standard 0.250" tab disconnect because it will not fit tightly enough. Connect the disconnect to the top prong of the relay (the one you just bent). Run the other end of the wire to pin #2, the left side, of the AC 115V INV 15amp fuse. This fuse has power all the time. I used a fuse tap which wraps tightly around one leg of the fuse and has a male tab on top. Again, use a crimp on type fully insulated female quick disconnecting terminal to connect the wire to the fuse tap. Now on to the dash switch and driver side relay/junction box. 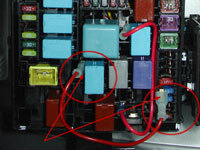 Pin #6 (yellow wire - red stripe) of the AC 115V switch is where 12v positive power is needed to activate the indicator light if the dash switch is depressed and the inverter is operating. 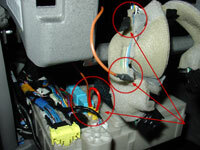 Pressing the dash switch brings ground from pin #3 (white wire - black stripe) to both the ground side of the indicator bulb and to pin #4 (blue) of the dash switch. 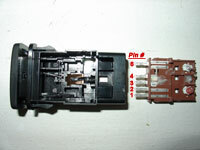 Additionally, pin #4 passes ground on to the negative side of the coil on the AC 115V INV relay. Currently pin #6 (yellow wire - red stripe) on the dash switch gets it's 12v positive power from the IG1 fuse which, as you know by now, is not active until the ignition switch is in the on position. We need to change that so that 12v positive can be sent to pin #6 anytime (with the vehicle off). This part of the modification accomplishes that. Make a jumper wire by taking a 3 inch piece of 14 gauge wire and crimping on a .250" spade solderless terminal to each end. On one of the ends, include a 9" length of 18 gauge wire as well. 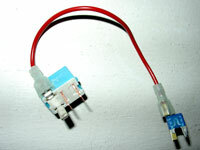 We will now perform the constant 12v power mod. Remove the DC SKT Relay by pulling it straight out firmly. Insert one of the spade ends of the jumper we just made into the power outlet relay socket #3 and the other end to socket #5. Sockets #3 and #5 are the only places a standard .250" spade soderless terminal will fit, so you won't have any trouble identifying where to insert the jumper wire. You will now have 12v power full time to both the front and cargo area 12-volt auxiliary power points. Now the 9" length of 18 gauge wire that is attached to one prong where the DC SKT relay was is getting constant power from the 15 amp Power Outlet fuse. We will use that to supply full time power up to the AC 115V dash switch. Cut the wire going to pin #6 (yellow wire - red stripe) on the AC 115V switch. These wires are wrapped in foam to prevent abrasion, so somewhere in the middle tear some of the foam off to expose the wire we need to cut. Now that the wire is cut in half, tape off the side coming from the upper dash area. Splice the wire coming from the DC SKT relay into the switch side of the yellow with red stripe wire. Use heat shring tubing or electrical tape to finish it off. Put the junction box, switches, and dash back together. Now with the key off test that the the 115V and 12V power outlets all have constant 12V power.